There are many ways of passing time in Ondo Ekimogun Kingdom. Males, Females, Adults, Children and the Aged have their different pastimes. The games adults play are different from those children. While adults usually play Ayo-Lopon game, the children have as one of their favorites, the game Lako. LAKO: Generally, Lako is both an indoor and outdoor game. It is mostly a game played by young girls and boys between the ages of nine and seventeen. Lako can be played by people of the same age group as well as mixed. That is a male and a female can engage one another in playing the game. It is a game that requires high level of concentration. An individual can also play it. 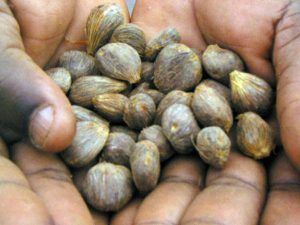 What is required is a set of either six pieces of ISE, PALM KERNEL NUTS or PEBBLES each about the size of a cube of sugar. The game balls, six in number, must be one that a player’s palm can obtain and hold. In playing Lako, the rounds are determined. Five rounds make one set. The rounds begin with the holding all the six items of game in the palm and splash-throw them on the play board. The play board is usually on the floor or on a mat. One of the game’s play items is proven by the turn players. In the beginning round, the player will throw the game item on hand up and must successfully pick one of the five game balls as well as catch the one thrown up. This, the player must repeat five times in the first round. If in the course of the round or any round at all, the player failed to catch or pick without touching another ball, the player is dead set according to the rules of the game. Picking a thrown up game ball without touching another game ball is a little bit difficult. Sometimes when the game is played on a mat, player’s hands must not touch the mat. If the player does, he or she will be accused of having touched the ball. Often, the game may come to some abrupt end as a result of the accusation and denials. The ever vigilant eyes of the player next in line when the play is dead by one player is always eager to call a play dead with the most little error on the part of a player. In many cases, it is only a third eye witness that calls the game dead when the contesting players are at logger head. But once a player successfully picks the game balls in the first set round, he or she automatically continues to the stage of picking two balls at a time and must be able to catch the ball that has been thrown up. The process then goes to catching the up ball and picking three balls, and also getting to four, and five balls to end the first round set. At this point, the successful player is regarded as having bought a house. The house bought is depicted by a material item. The material item is what signifies to a spectator mate who is leading the player. Some parents do not allow their children to play Lako with those they consider troublesome or whose parents are troublesome. However, many children do not listen to their parent’s warnings when they are interested in playing Lako. Entrepreneur mothers especially do not want their children to be engage in Lako because, their children, rather than go about their businesses of selling will either be watching the game or playing it. As a result, they would not have made the expected sale. Usually, they would be admonished and punished. AYO-LOPON: Ayo-lopon is an old age game that is generally played by males or females adults. Only two people can play the game at once. The Ayo-lopon which is SEEDING BALLS used for the game is made from special seeds of the rope tree called by the name given to the game (Ayo). Opon is the name given to the playing board of the game. No less than forty-eight pieces of the Ayo Seeds are required for the games play board. The board is usually about one foot in length and three inches in breadth. The games board is carved into it a set of six two equal size depth holes facing one another. 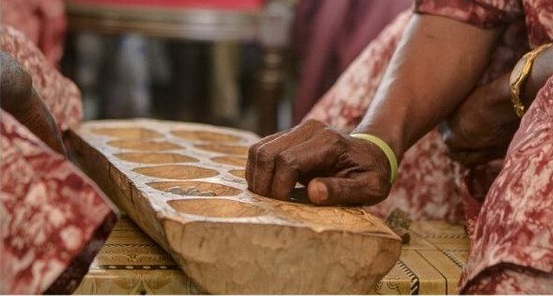 The Ayo Seeds are placed into each of the six two equal size set of holes in groups of four pieces each. This adult game demands as much concentration as the chess or draught games. The attention required in this game is quite enormous and takes a lot of time before a round game is concluded by many who are experienced and are considered to be masters of the game. In playing the game, the two players are always seated comfortably with the Opon Ayo placed between them with the players sitting in a face-face formation. The Opon Ayo between the players makes a formation of the plus sign of the arithmetic’s table while the rules of the game are that players begin playing clockwise. The player makes the beginning moves in the play by taking any of the four pieces of the Ayo in one of the six holes on his or her side of the game board and putting each of the Ayo in simply another game board hole in attempts to establish what is called ODU. Sometime, the move will backfire on the player setting up the strategy because it is a very big gamble. A lot of strategy moves are planned to be executed in the course of playing a round of the game. For the purpose of understanding, there is a PLAYER “A” and there is PLAYER “B”. As a PLAYER “A” makes his or her moves, the moves are pure calculation of what will be the exact moves of PLAYER “B”. Should PLAYER “B” move toward directions different from the expectations of the thoughts of PLAYER “A”, then PLAYER “A” must go back to the drawing board of his or her summation of the knowledge and experience of PLAYER “B”. At every step of the way in the playing of the game of Ayo-Lopon, the idea is to be able to win or capture the most numbers of the Ayo Seeds on the home side of your opponent. Your opponent is also trying to win more of the Seeds on your side each of the Players can only win either two or three Seeds at one play turn and move. For example, if PLAYER “A” has three Seeds on his or her home side, for that Player to be able to have a successful play turn, PLAYER “B” must have at least, one Ayo Seed in a hole on his or her home side. If this is the case, PLAYER “A” will end up with at least two Seeds to take home from that play turn. Also, if there were two Seeds there, he or she will end up winning three Seeds. But if there were already three Seeds in the hole, the play turn is an unsuccessful play turn. No one can win four Seeds or one Seed. The better the PLAYERS are not difficult to identify by spectators of the homely game. The winner at the end of each round of play depicts the looser with an identifying object. Better still, the spectators can simply adopt the greeting statement that apply to most adult game play settings MOH KUN TA O means I greet the play master. It is the master mind that usually responds with OTA E JE, OPE LE FOHUN means the master is responding the fools mind cannot respond.